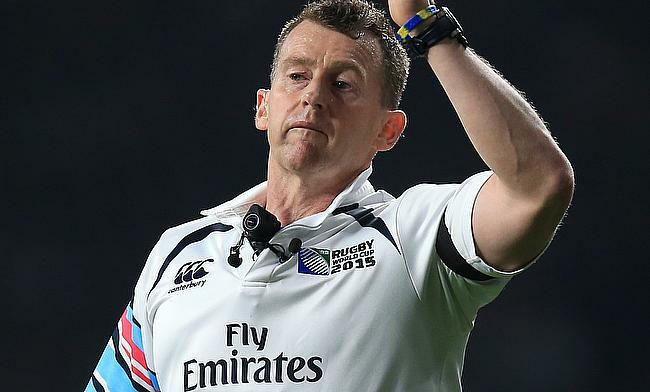 Top referee Nigel Owens will officiate in the first qualifying match for Rugby World Cup 2019 when St Vincent and the Grenadines host Jamaica on Saturday. Welshman Owens took charge of the 2015 World Cup final when New Zealand beat Australia 34-17 at Twickenham on October 31, and will now help kick off the global tournament's new four-year cycle. Qualification for the 2019 World Cup in Japan will comprise almost 200 matches, starting with the March 5 clash to be overseen by the game's preeminent official. "It's an honour to be appointed to this important match and I will prepare the same way as I always do," said Owens. "Every time I take the field as a referee it is an honour and even more so when it's a Test match. "Refereeing the Rugby World Cup final was a wonderful experience and one that I will treasure forever but every match is memorable in its own way and I am really looking forward to this next challenge." Governing body World Rugby expect more than 3,000 players to contest the qualification for World Cup 2019, with matches spanning six continents. South African referee Craig Joubert refereed the 2011 World Cup final between New Zealand and France, then progressed to take charge of the first qualifier for 2015, between Mexico and Jamaica in Mexico City. Owens now follows suit in taking a role in the first steps towards the 2019 tournament in Japan, with World Rugby chairman Bernard Lapasset proud of the continuity. Lapasset said: "It is fitting that Nigel should referee this match as it creates a sense of continuity and shows how important even the first qualifier is in the entire process. "Ambitious unions can use qualification for rugby's showpiece tournament as something to aim for, and in the years to come, I believe we can expect to see new teams make their Rugby World Cup debuts."